Directed by Asif Kapadia and produced by James Gay-Rees. ‘SENNA’ is the thrilling story of the Brazilian motor-racing legend, Ayrton Senna. Spanning a decade, it follows his battles on track and off, against the politics infesting the sport. 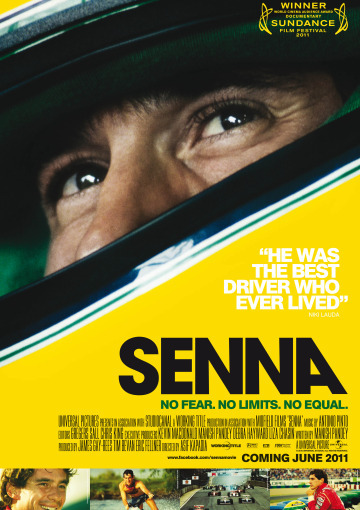 Sublime, spiritual, occasionally ruthless, Senna conquers Formula One to become a global superstar. SENNA was released worldwide by Universal Pictures, the film has broken many records; it is the highest grossing British documentary of all time at the UK box office ($5.2m), the second highest grossing documentary in the UK (behind Fahrenheit 911). SENNA has a worldwide box office of over $12m and has sold over 1 Million DVDs / Blurays in the UK. SENNA was selected for the Royal College of Art’s prestigious 175th Anniversary Exhibition in November 2012, ‘The Perfect Place to Grow’ was an exhibition of 350 works of art created by the RCA’s alumni and featured work by Henry Moore, David Hockney, Ridley Scott, the Chapman Brothers, Barbra Hepworth, Ron Arad, Bridget Riley, Tracy Emin, James Dyson, Chris Ofili and Peter Blake amongst others. Senna won two BAFTA awards for Best Documentary & Best Editing and was Nominated for Outstanding British Film.